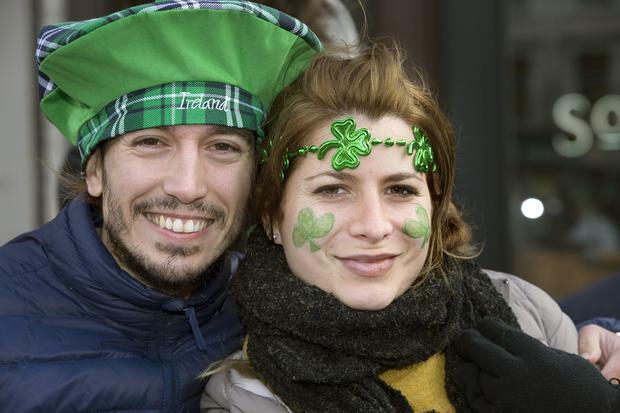 MET ÉIREANN has warned of heavy showers across the country as thousands of revellers take to the streets for St Patrick's Day parades. The national forecaster said Sunday will be a "rather cold day with bright or sunny spells and scattered showers" to start. However the showers are expected to become more widespread for a time in the early afternoon with a few turning heavy, especially in parts of Connacht and Munster. "Highest temperatures will be between 7 and 9 degrees in moderate to fresh west to northwest winds, winds increasing strong and gusty at times in the west and southwest and especially around heavy showers," Met Éireann said. Parade-goers are advised to bring a rain jacket with them. This morning, coastal counties will see wintry showers and a risk of hail and thunder. While the day will mostly see sunshine as festivities kick off in the early afternoon, strong winds and rain will batter the country as the day goes on and this evening is set to be dry, with bright sunshine. Highest temperatures throughout the day will be 7 to 9 degrees. Good news in store for those heading out tonight as the heavy rain and strong winds will clear. However, it is set to be quite cold as temperatures will drop to lows of 1 to 5 degrees with some icy patches tonight. As a result of the weather, a Céilí Mór planned at St. Patrick’s Festival Village in Dublin's Merrion Square on Saturday was rescheduled for Monday. 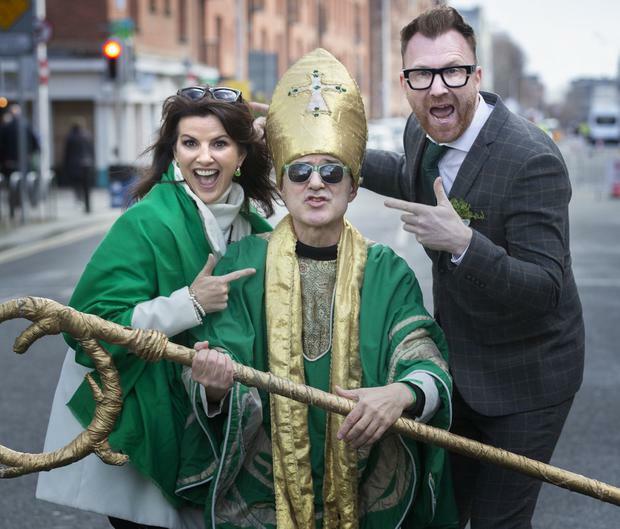 A spokesperson for St Patrick's Festival said that the event was rescheduled due to high winds earlier in the morning. "An Garda Siochána and Dublin City Council have generously facilitated this change of date for the Céilí Mór. "Festival Village opens today at 12 midday and runs until 6pm this evening. It also runs 2pm to 6pm tomorrow, Sunday March 17 and 12 midday to 6pm on Monday March 18." A number of diversions will take place across many Irish roads on St Patrick's Day, as well as changes to public transport. In Dublin, the Festival parade will begin at midday, with streets around the route closed from early morning until 6pm. The parade takes off from Parnell Square and makes its way through O’Connell St, around College Green, up Dame St to Christchurch and down the appropriately named Patrick St to finish on Cuffe St. The following Luas stops will be closed during the parade: Dawson, Westmoreland, O’Connell – GPO, O’Connell Upper, Parnell, Marlborough and Trinity, Four Courts, Jervis, Abbey Street, Busáras, Connolly, George’s Dock, Mayor Square – NCI, Spencer Dock and The Point. DART and commuter services will operate on a Sunday schedule with extra services in place, but Tara Street station is closed until 4pm to aid in the Garda crowd management plan for the parade. Similarly, there will be a number of diversions in place for Dublin Bus. A full list of changes can be found on their website. Outside the city centre, smaller parades take place around the county on Saturday, including Blanchardstown, Lucan, Swords, Balbriggan, Lusk, Rush, Skerries, Blackrock, Tallaght, Clondalkin, Rathcoole and Stepaside. Around 50,000 attendees are expected to take to the streets of Cork with the parade beginning in the city at 1pm. The Galway city parade will leave NUIG at 11.30am, with a new route this year, heading from NUIG to Eyre Square via University Rd, Salmon Weir Bridge and Eglinton St.
"If you’re not attending a parade but planning a journey on the 17th, try to avoid town centres in the afternoon by sticking to motorways and bypasses where possible," a spokesperson for AA Roadwatch said. "If you are driving into a city or town centre, use extra caution as there will be more pedestrians than usual." Meanwhile, gardai have advised the public that it is illegal to drink in public places. The Road Safety Authority (RSA) warned motorists that the gardai will be" out in force targeting drivers under the influence of drink and drugs" over the St Patrick’s Weekend. Drinkaware have challenged Irish drinkers to "break the Irish drinking stereotype this St. Patrick’s Weekend" and urged them to use caution over the long weekend. "The long weekend also provides more opportunities to bring the family together at home, which makes it more likely that children will be around adults who are drinking," a spokesperson said. "St Patrick’s Day is all too often associated with alcohol and can be widely accepted as an excuse for drinking excessively. “The Drinkaware Index shows that 44pc of the drinking population in Ireland consume alcohol in a harmful manner. But despite this, we can see that the appetite for drinking alcohol in moderation is growing." Despite a wet weekend, early forecasts for next week show a lot of dry weather, with temperatures becoming mild. "Showers will retreat to Atlantic coastal areas on Sunday night and good clear spells will develop," Met Éireann said. "Monday will start dry and bright in the east but cloud and rain will spread from the west during the morning." Gardaí are encouraging everybody who wishes to attend the St Patrick's Day parade to please use public transport. There will be zero tolerance of drinking in public places this St Patrick's weekend as all alcohol will be confiscated, An Garda Siochana has warned. Chief Superintendent Lorraine Wheatley said that, in the past, 150 barrels' worth of drink was seized and that the same measures will be in place at the weekend if people are caught drinking in a public place, such as the tourist hotspot Temple Bar. "We would rather prevent it, but we will take the drink off them," said the senior garda. Gardai are also urging parade-goers to leave the car at home and use public transport. 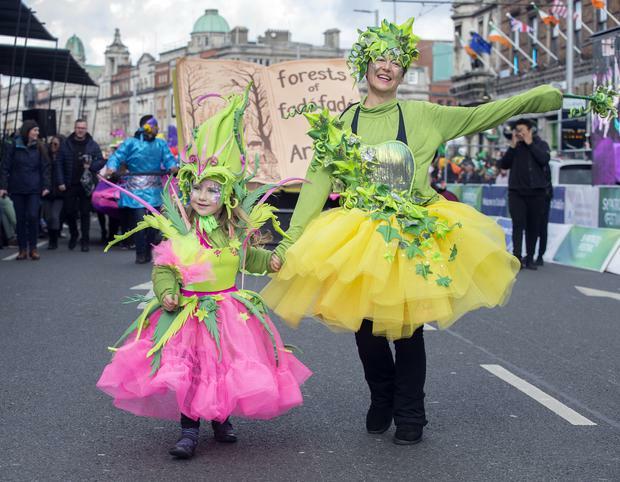 For parents travelling with children to parades, gardai advise to keep them under supervision. “Children should have phone numbers for their guardians in the event of accidental separation,” the spokesperson added. Free child safety wristbands are available at Bridewell, Store St, Kevin St and Pearse St Garda Stations, which are luminous yellow in colour and provide a blank space for a telephone number. Revellers in Dublin are advised to select the area that they want to view in advance of travelling and arrive early due to expected large crowds. “If you live outside the M50 try to leave your car outside the M50,” said a garda spokesperson. The public is also advised to mind their belongings and follow signage and directions from stewards and gardai.